Learn various tips and tricks about doodling and transforming it into a peice of art. If you think that you aren't that artistic person , then this workshop is for you, as you shall be surprised by your own creation. Everything will be guided step by step. For the first 45mins, practise sheets will be given to our participants which will help them get in sync with their eye-hand co-ordination and will also help them attain their Zen state of mind, for which we also describe this form of art as Therapeutic Doodle Art as it relaxes a person completely and also helps them feel calm and increases their focus. By end of the workshop, participants will draw their own Doodle Art on a black sheet with a white ink pen which will additionally give a great effect to their drawing. So gift yourself a memorable art experience and indulge in this de-stressing art workshop. Open for all age groups and children above 8years can participate as well. Registration is Compulsory. (The fee is inclusive of all art material and food and beverage coupons worth Rs 300/-) For more details , contact us on 9987391664. Also visit our Facebook page : " Artistic Ant" if you wish to have a glimpse of our previous workshops. 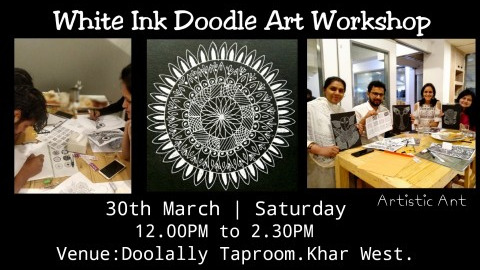 Share "White Ink Doodle Art Workshop"